Remote connections is a project that explores the idea of both being remote and being connected. The primary focus of this project is the evolution of a collaboration between people in remote Indigenous communities and myself to co-create locative and flexible web-based tools for cultural and creative purposes. The secondary focus is more poetic and philosophical – starting with a semantic unraveling of the meanings of what determines remoteness and being connected. These ideas also feed into my interests in mapping, story telling and cultural implications of site. So far I have made some great contacts and have started a blog at remotexmedia.wordpress.com, a Facebook page https://www.facebook.com/RemoteConnections, written a paper and a presentation for ISEA2011. We will see what happens from there! As a mean to start building relationships with communities, I am currently developing a website for Billabong Aboriginal Development Corporation as part of my volunteer role with Indigenous Community Volunteers. I also recently undertook Webex training as part of the Remote Indigenous Public Internet Access program managed through the Northern Territory Library. Now I have been trained to use this software I will be able to train other people to use Webex. To further develop my knowledge of language and culture I have enrolled in Ninti Ngapartji – the Ngapartji Ngapartji online language course, which looks really interesting. this course is delivered online for free and I think it is an excellent initiative. era of accelerated globalization’, Continuum: Journal of Media and Cultural Studies, vol. 16, no. 2, pp. 201-220. 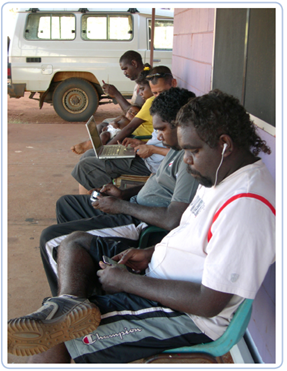 Home Internet for Remote Indigenous Communities, ARC Centre of Excellence for Creative Industries, the Centre for Appropriate Technologies and the Central Land Council. Thanks to Martin Drury, Bronwyn Pollock, Andrew Taylor, Nicholas Kirlew, Jim Best, Metta Young, Susan Schuller, , Aaron Corn, Catherine Wohlan, Clare Maclean, Inge Kral, Fiona Sivyer, Jackie Calderwood, Sonja van Kerkoff and Liam Campbell for your time, energy and support.